The Basics: There are very important reasons for learning to combine your foods correctly. Before the foods we eat can be absorbed through the intestinal tract and transported to the cells of our body via the bloodstream, they must first be broken down into simpler biochemical forms. The key components necessary for this process are called enzymes. Enzymes are the active elements in the digestive juices responsible for the proper chemical breakdown and digestion of our food. These enzymes have specialized functions and definite limits in their capabilities. Different digestive enzymes are secreted for digesting specific types of food. For example, an enzyme that helps digest fats will not break down protein or carbohydrates. Likewise, an enzyme that digests carbohydrates will not work on fats or protein. The process the body uses for the digestion of proteins is different from the process used for the digestion of carbohydrates and starches. Our systems are not designed to digest numerous types of foods at the same time. Improperly combined foods are poorly digested and produce toxic metabolic by-products. The buildup of these toxic by-products in the body can be the source of many serious health problems. Although changing our dietary habits can present a challenge, the rewards of vitality, health and well-being are definitely worth the effort. There are remarkable benefits to being physically, emotionally and mentally happy when we choose to cooperate with our body’s biological capabilities and follow the principles of proper food combining. Proteins are used in building and repairing tissues and require an acid medium in which to digest. Carbohydrates (starches), the main source of energy for all body functions, require a more alkaline medium, and should not be eaten with proteins. Fats and oils provide us with vitamins and the most concentrated source of energy in our diet. They also slow down our digestive processes, so it is better not to combine fats and protein, which already takes a long time to digest, at the same meal. Simple sugars such as fruits, honey, syrups, etc., are quickly digested and should not be eaten with protein. Low and non-starchy vegetables are the only foods that can be combined with protein. Protein derived from animal sources stay in the digestive tract a very long time. High quality protein found in fresh fruits, vegetables, raw nuts and seeds, whole grains and legumes, pass through much faster. And YES, PROTEIN can be obtained from fresh fruits and vegetables! Carbohydrates (simple sugars and complex starches) supply us with fuel for the muscles, nervous system and brain. Please don’t go on a low carbohydrate diet! It is best to eliminate consumption of “refined” carbohydrates such as white flour products, white sugar, candy and cola drinks and other “junk foods” that cause toxicity and vitamin/mineral deficiencies in the body, but do not give up your fruits, vegetables, seeds, nuts and whole cereals and grains. Fats provide energy, serve as carriers to fat-soluble vitamins, and are an integral part of the process whereby calcium is made available to the tissues of the body. Fatty acids are necessary for normal growth and for healthy blood, arteries, and nerves. The highest quality sources of fats and oils will be found in fresh fruits such as avocados and olives, vegetables, raw nuts and seeds, whole grains and legumes. Do not eat when you are really upset, stressed or after a hard workout. Eat only when hungry and stop before you are full. Do not eat foods that are too hot or too cold: they can damage the enzymes necessary for proper digestion. Room temperature is optimum. Drink little or no liquid during meals; it dilutes digestive juices and impairs digestion. Always avoid refined, canned, fried, and processed foods. Learning to combine foods properly is not just a passing trend. 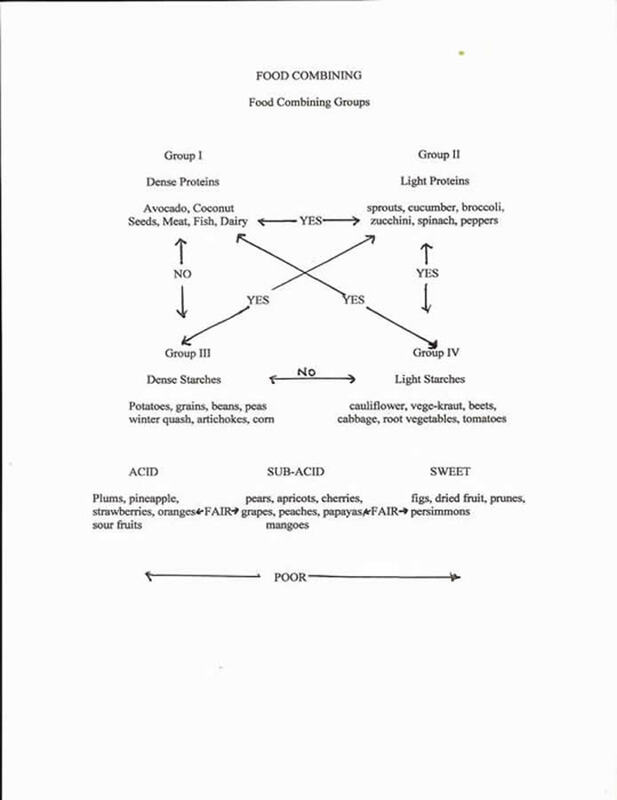 The principles of proper food combining are scientific, biochemical fasts of life. A positive and loving attitude towards yourself, others, and life, along with a healthy diet, is the ultimate combination for a long, joyous and productive life. RED JUICY TOMATO - What more can be said?